After following the steps in Get Started, you may be wondering what’s next. There are many directions you can go in depending on what you are trying to do. Below, we present a few ideas of what to think about next including security, improved search and styling, and paging. Authentication is verifying the identify of a person or device (an account in general). Scrapbook101 does not have authentication implemented, but it can be added. This is especially important when running live. For example, you can add code to allow users to sign in with Google, Facebook, Microsoft accounts as well as by other means. Even if your Scrapbook101 implementation is open, tracking who makes and edits entries is useful. This can be done by capturing the associated email or user name and using that in the updatedBy field in the item-document. If the intent of your Scrapbook101 implementation is to allow only certain accounts access, then you need to additionally set up Authorization, that is, associating privileges to specific accounts. In fact, you should never store personal information (be it with Scrapbook101 or any other means) without authentication and authorization in place. For an overview of security in ASP.NET Core, see Introduction to authorization in ASP.NET Core. The approaches discussed there could be useful when running locally. When running as a web service such as in Microsoft Azure, see Advanced usage of authentication and authorization in Azure App Service. The create, delete, update, and edit pages (under the Views\Item folder) are currently minimally styled. They can be improved and rearranged as needed. For example in the edit page, the description field can be customized for long or short descriptions and fields that can’t or shouldn’t be changed (like id and type) can be removed from the form. In contrast to the CRUD pages, the Scrapbook101 main page (Views\Item\Index.cshtml) is styled more. We use Bootstrap to demonstrate a possible visual representation of Scrapbook101 items. Specifically, Bootstrap cards structure is used which shows one asset image if it exists or else show a default image as specified in the configuration file (either web.config or appsettings.json) along with a snippet of the title and description of the item. All the scripts for styling are injected in Views\Shared\__Layout.cshtml. A more practical approach is to bundle the scripts together and include them in the App_Start\BundleConfig.cs. All the scripts for styling are injected in Views\Shared\__LayoutScrapbook.cshtml. A more practical approach is to bundle the scripts together and include them using a tool such as Bundle & Minifier or BuildBundleMinifier. Paging is not currently implemented for Scrapbook101. Paging features can be added by modifying the search results in the ItemController.cs file where results are returned in the SearchAsync method and returned to Views\Item\Index.cshtml. Our experience running our personal version of Scrapbook with over 6000 entries and without paging is that we don’t miss not having the functionality. We show one page of results for a search. If we don’t find what we want, we make the search more precise or change the number of results displayed. This is sufficient for most of the searches we make so that we haven’t felt the need to implement paging. Takeaway message: don’t implement paging until you have other more important features like security and searching in place first. 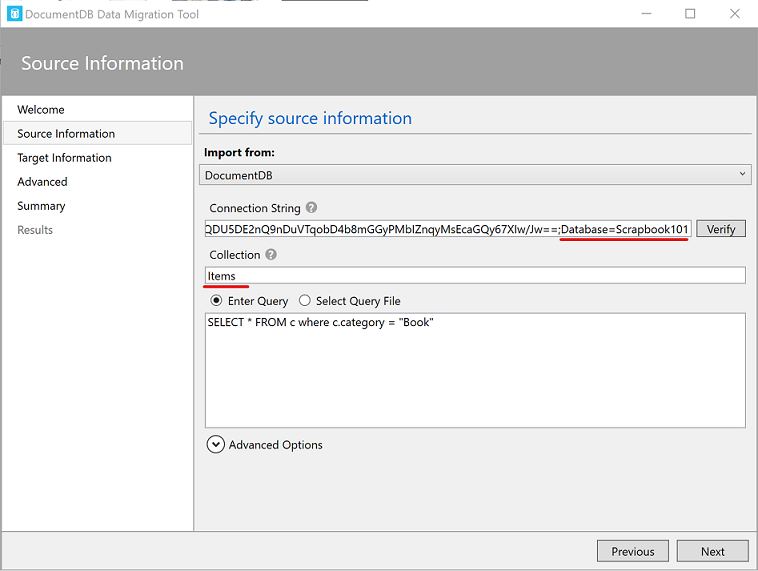 If you ran Scrapbook101 locally and start to add entries and then decide to go-live, you can transfer your local data to your on-line data-store using the Azure Cosmos DB Data Migration tool. When using the migration tool, be sure to correctly set the Connection String and Collection fields. For example, after running the Scrapbook101 code you should have a database “Scrapbook101” with a collection “Items”. These values are used in the migration tool as shown in the following screenshot.